As an international congregation, we strive for unity in diversity of cultures and nationalities. It is a point of wisdom and love to encourage the free and healthy development of native customs and culture. When we share the native customs and culture of our provinces/regions, we are personally enriched, our solidarity is strengthened, and our whole congregation is unified. 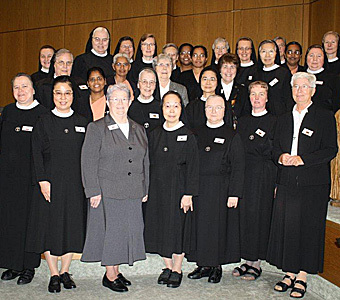 Each Sister among our 992 members (as of January 1, 2012) is encouraged to take responsibility for the congregation. We are conscious of our differences and cherish what these differences bring to the whole. We encourage the active sharing of the talents, the insights, the experience, and the knowledge of each Province and Region toward the good of all. We strive to create an environment in which this cooperation is not only made possible but openly welcomed and embraced.